The 110-acre Chippewa Run Natural Area doesn't have sand dunes or long stretches of Lake Michigan shoreline but does feature an interesting history and a variety of habitats that make for excellent birding. Much of the trail system was built in 2007-08 and today is a pair of separate loops that total less than 1.5 miles. The 110-acre Chippewa Run Natural Area doesn’t have sand dunes or long stretches of Lake Michigan shoreline but does feature an interesting history and a variety of habitats that make for excellent birding. Chippewa Run is a groundwater-fed stream that flows a mile west into South Bar Lake and is named for the Anishinaabek tribes – or Chippewa Indians – who staged seasonal hunting and fishing encampments along it. Early settlers cleared much of the land and planted orchards on both sides of the creek. 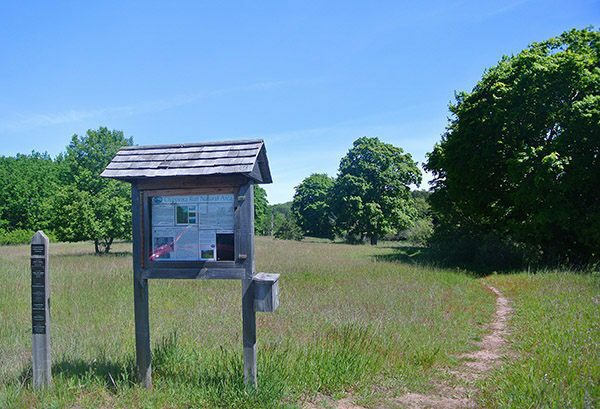 Eventually, the tract became known as the “Gateway to Empire” and when it was at risk of becoming a housing development the Leelanau Conservancy led a successful campaign to purchase the area. Chippewa Run Natural Area was dedicated in 2000. Since then, Conservancy volunteers have recorded nearly 80 species of birds at Chippewa Run. They range from American bitterns, great blue herons and wild turkeys to grasshopper sparrows and Eastern meadowlarks in the meadows, northern waterthrushes and Wilson’s warblers in the thickets and a variety of waterfowl in the ponds and wetlands. At the south end of the preserve, green herons nest in the pines. Much of the trail system was built in 2007-08 and today is a pair of separate loops that total less than 1.5 miles. Though it is short, the scenery is interesting and includes a variety of wildflowers, blue flag iris, cardinal flower and water lilies among them. There are excellent fall colors along the creek and old apple trees that still bear fruit. From the main trailhead on M-22, two trails depart into the open field — Fisher Street Access Trail to the west and Creek Crossing Trail to the north. Creek Crossing begins by skirting a wetland that includes Chippewa Run and arrives at a small pond loaded with horsetail reeds and a pair of benches that overlook it. 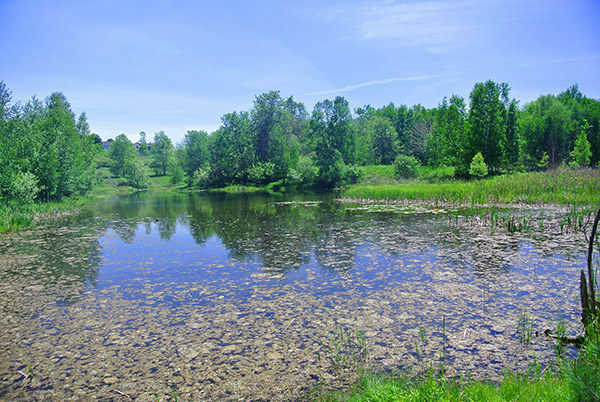 A property owner created the pond in the 1960s and for years it hosted an active beaver community. From the benches, the trail crosses Chippewa Run via a foot bridge and merges into Orchard Loop on the edge of the old apple orchards on the other side of the creek. Bear right and the trail ascends gently into a red pine plantation as a wide path before swinging west and heading back to the orchards. Even though many trees are gone, the patterned rows of an apple orchard are still evident. At Mile 0.46 you pass the junction with the Crossover Trail and then arrive again at the meandering Chippewa Run, set in a small forested ravine of native dogwood, black cherry, ash, maple, and poplar. On the other side of the creek, a stairway leads up to the Village of Empire’s North Park. The trail skirts the edge of the stream corridor for a short distance, passing some huge maples along the way, and then swings east to return to the open orchard again. At Mile 0.9, you arrive at the junction and the bridge over Chippewa Run and backtrack to the trailhead. To add another quarter mile to your walk, cross M-22 for the Beaver Pond Loop that begins by skirting a cattail-choked marsh to a large, open pond. 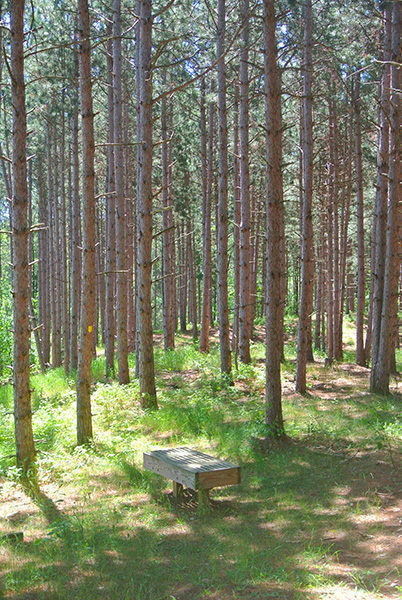 At this point the trail climbs a red pine-forested ridge, topping off at a bench with a view of view of the pond below. You then follow the ridge back to M-22. There are no facilities at the Chippewa Run trailhead. Chippewa Run is open year-round and its gentle terrain makes the preserve conducive to snowshoeing and Nordic skiing in the winter. There are no fees for enjoying the trails. From M-72 in Empire, head north on M-22. 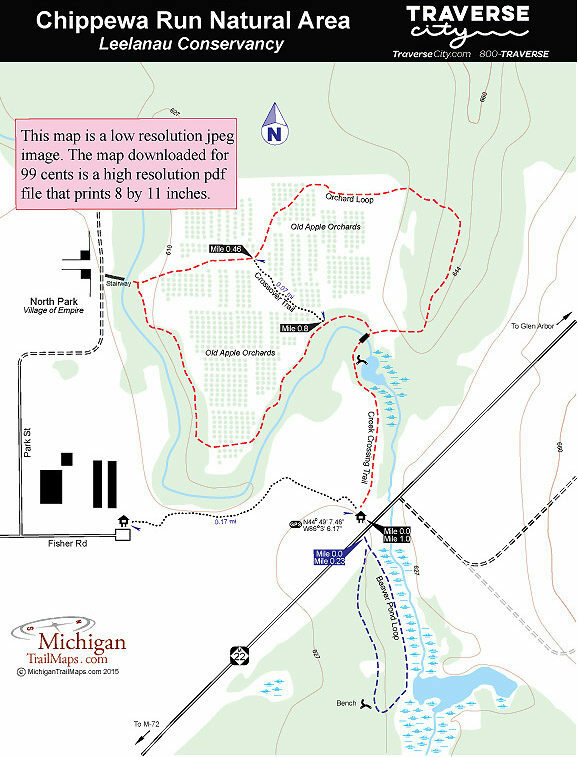 In less than a mile Chippewa Run is posted on the west side of the state highway where there is parking and a trailhead for the Orchard Loop. Across the road is the start of the Beaver Pond Loop. In winter, if the parking lot on M-22 is not plowed, turn onto LaCore Street near the Empire Area Museum and within a third of a mile, east on Fisher Street. There is a trailhead at the recycling area at the end of Fisher Street. For more information, contact the Leelanau Conservancy (231-256-9665). For lodging or travel information contact Traverse City Tourism (800-872-8377; www.traversecity.com).